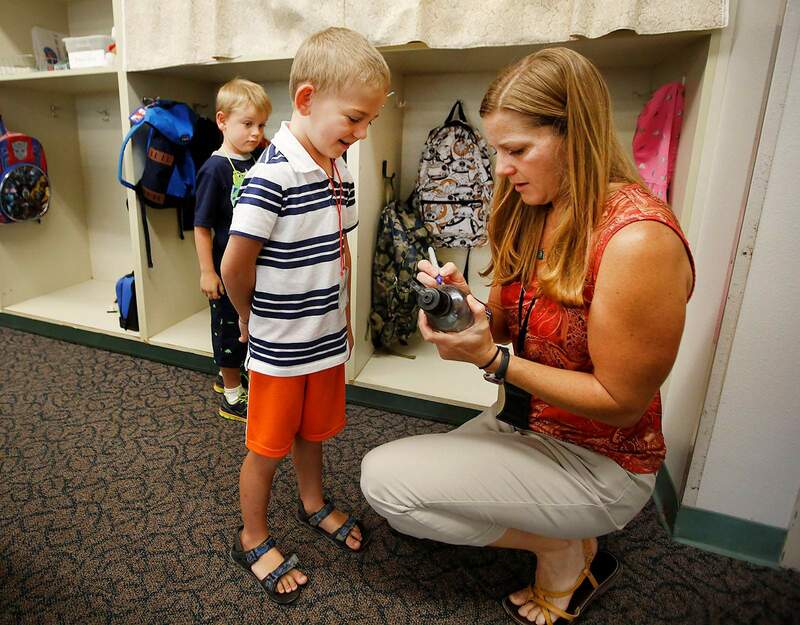 Susie Shows, kindergarten teacher at Needham Elementary School, helps Jack Schowalter, 5, and Jack Kuhn, 5, left, organize their school items on the first day of school in August 2017. Gov. Jared Polis’ plan to fund full-day kindergarten could free up more than $1.35 million for Durango School District 9-R.
Gov. Jared Polis plans to fulfill a signature campaign promise by offering $227 million to the state’s school districts to fund full-day kindergarten, a proposal that could free up more than $1.35 million for Durango School District 9-R. The funding proposal, announced Tuesday, would provide relief to school districts like 9-R, which has helped fund full-day kindergarten out of its general fund for more than 20 years, said district spokeswoman Julie Popp. The state funds half-day kindergarten for all of its schools, but Durango is among the many districts that have opted to fund the other half of the day by pulling their own funds or charging parents tuition. Polis’ proposal would allow the district to put the $1.35 million it spends on 405 kindergartners back into its coffers. But the proposal will have to be passed into law by the Legislature, and some lawmakers have expressed skepticism that Colorado’s budget can handle the investment. Rep. Barbara McLachlan, D-Durango, chairwoman of the House Education Committee, said she is helping craft a kindergarten bill, which has not been finalized. The kindergarten money for next year will not be diverted from other pieces of the budget. Instead, the provision depends on an expected budget surplus, from property tax revenue, that could change later this year. Polis’ proposed funding would last only a year, and he did not discuss long-term plans for paying for full-day kindergarten. The governor will address concerns with his budget on Wednesday afternoon with lawmakers on the Joint Budget Committee.